Wall of freezer cabinets full of dumplings. H-Mart is a U.S. Asian supermarket chain with locations throughout the United States, Canada, and London and with 61 locations is the largest Asian grocery store chain in the U.S. The “H” in “H Mart” stands for Han Ah Reum, a Korean phrase meaning “one arm full of groceries”. I love H-Mart, their produce is incredibly diverse and always super fresh, they give away tons of free samples including a wide range of kimchi styles, there is also often a food court full of kiosks selling cooked Chinese, Korean and Japanese food, and they have a wall of freezer cabinets full of dumplings. 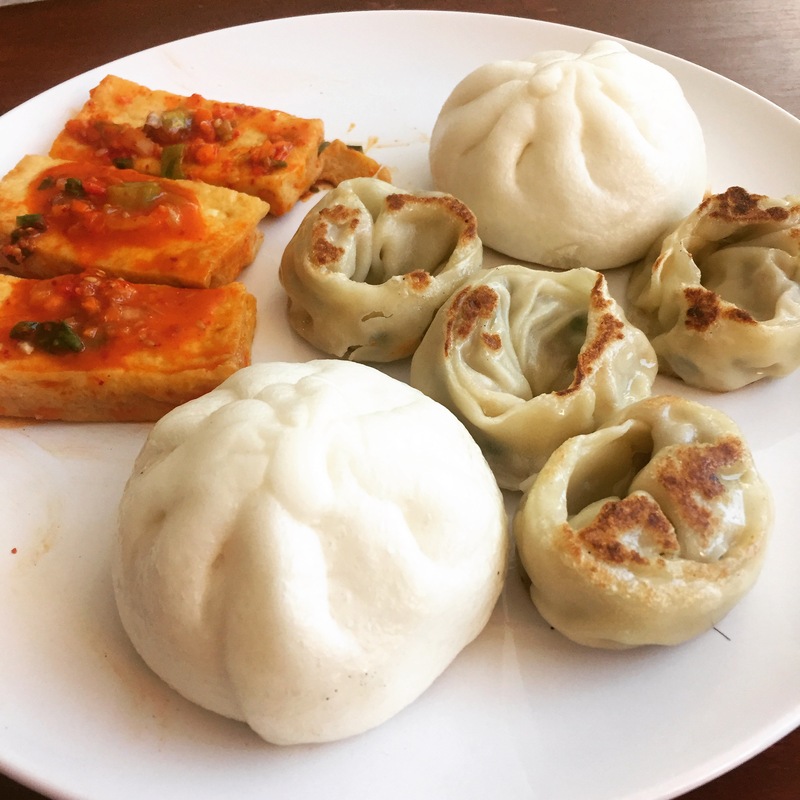 Jumbo Leek Buns, Vegetable Dumplings and Stewed Spicy Tofu. 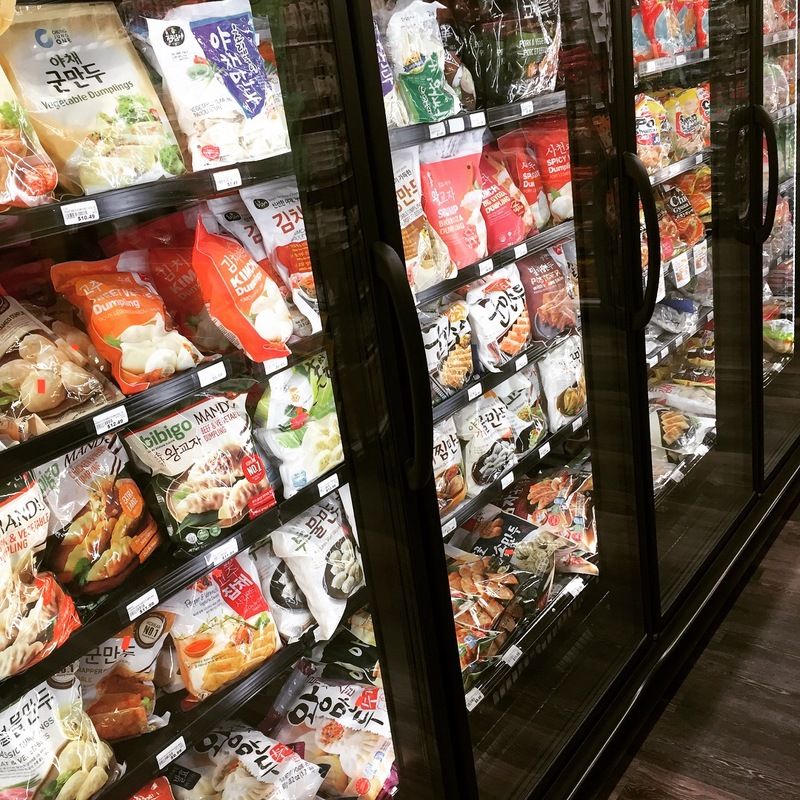 H-Mart also sells lots of hot, cold and room temperature to-go prepared foods including dumplings, buns, a huge range of banchan (Korean appetizers) and a wide range of savory pancakes. 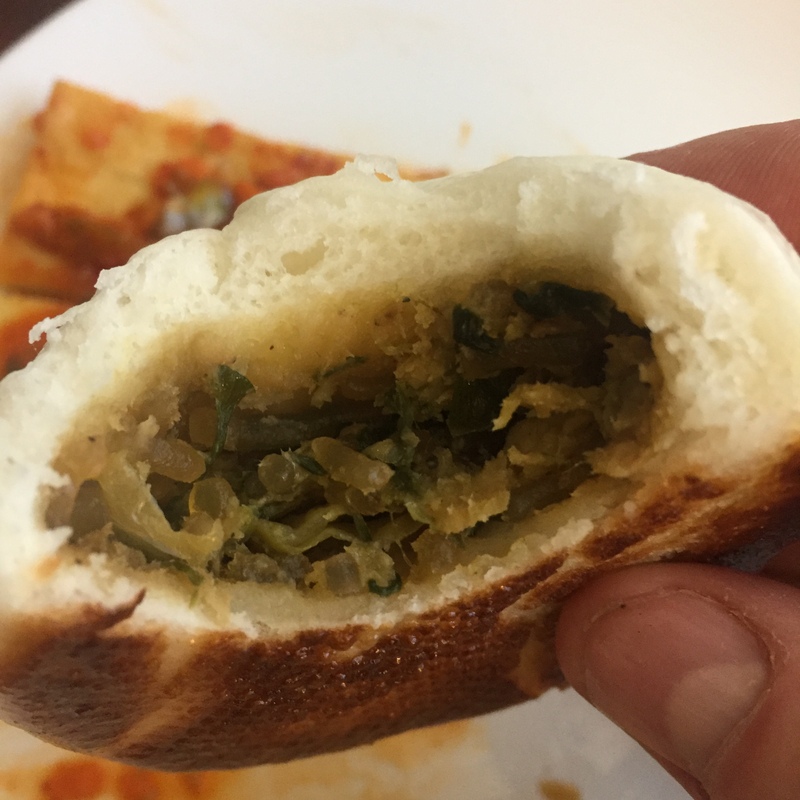 I recently tried the Jumbo Leek Buns which are filled with bean curd, onion, cabbage, green cabbage (I am assuming these are leaks), and green chili pepper. These buns were really good, with a slightly sweet flavor from the cooked leaks and a little bit of spice pepper heat. They are particularly good if you pan fry the bottom of the buns so they are crispy and golden. I also grabbed some Vegetable Dumplings, which are filled with cabbage, soy bean curd, soy bean protein, onion, leak, soy sauce and sesame oil. The dumplings were not as good as the buns, they had a general, mild savory flavor with a hint of cabbage and onion flavor. But the texture of the filling was nice, with a slight crunch from the cabbage. These dumplings didn’t really scream healthy green veggies, but were good with a dipping sauce. On side note, H-Mart’s tofu in spicy red pepper sauce is excellent. This entry was posted in Korean, Vegan, Vegetarian, Veggie Dumplings. Bookmark the permalink.